Multiple reports on Friday have the Phillies promoting often injured outfielder Roman Quinn to fill a spot on the team's major league roster. The addition will give the club an elite defender and a switch-hitting contributor that is a stolen base threat that can get in pitchers' heads . The Phillies' 2nd round draft pick in 2011 has posted a .305 average with a pair of homers, 11 RBI and 14 steals in 28 games with Triple-A Lehigh Valley this year. He's been working his way back of late, following surgery to repair a torn ligament in his right hand. 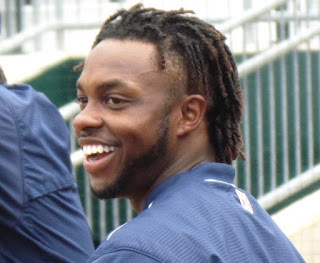 Starting with his first full season in professional baseball in 2013, the center-fielder and sometimes-shortstop, Quinn, has played in 378 games throughout the Phillies organization. During those five and a half seasons, the 25-year-old has spent 405 total regular season days out of action with injuries that, in addition to this year's ailment, range from a broken wrist to a torn muscle and from a ruptured Achilles tendon to and oblique strain. Those tallies of days count his team's scheduled opening day through the last day of the minor league regular season, which is Labor Day each year. The total amount of days injured increases to 432 by figuring that he could have been with the big league team to wrap up the 2017 campaign and that season lasts another three to four weeks. The calculations do not count time spent in off-season leagues. Having more days sidelined than actually on the field really proves the narrative about Quinn as seen in the embedded tweet below. #Phillies Twitter all jacked up for Mr. Glass, Roman Quinn. Hope he makes it out of the weekend. Here's hoping Quinn can stay healthy and help the first place Phillies (58-44) continue to succeed.